In order to simulate the imperfect calibration (resp. alignment) of the detector, one has to artificially miscalibrate the calorimeters (resp. misalign the geometry). The tools presented here have been developed for this purpose. The tools described on this page were used to populate the offline conditions database with expected miscalibration and misalignment scenarios corresponding to startup, 1pb-1 and 10pb-1 of integrated luminosity for the CSA08 alignment and calibration exercises. For more information about including conditions data from the offline conditions database in a CMSSW job, see SWGuideFrontierConditions. Setup shown for %WBRELEASENEW%; use release noted in newsbox above. 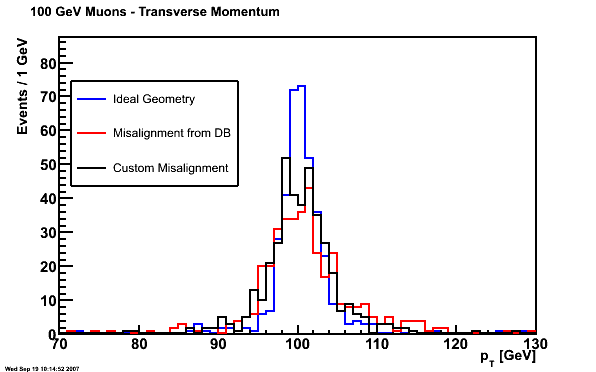 Tracker Misalignment scenarios which are ready to be used for physics and other analysis are available in the database and can be accessed via Frontier. They are usually part of a Global Tag. NOTE All files used in this section can be found also in /afs/cern.ch/cms/Tutorials/september06/Misalignment/CMSSW_1_6_0_files. write a custom (mis)alignment file (can also be used for alignment "by hand"). In any case, at least part of the (global) reconstruction has to be re-done with the misaligned geometry. In this tutorial, we start with a sample of reconstructed events. We modify the configuration file used for the final CTF fit (baseline Kalman track fit) in order to refit the reconstructed tracks in the misaligned geometry. The transverse momentum of the tracks is then compared before and after misalignment. Database setup: the toGet parameter tells which tag to retrieve. Here, we retrieve the global positions and errors on the global positions from the "100/pb scenario", representing the alignment knowledge after few months of physics run, or 100/pb. The data is read through the Frontier cache. Refitting: we include the configuration fragment performing the track refit, using the final CTF tracks as input, RefitterWithMaterial.cff. Misalignment: the object read from the database has to be applied to the geometry, which is built by the TrackerDigiGeometryESModule. So we ask this module to apply this object with replace TrackerDigiGeometryESModule.applyAlignment = true, overriding the default value. Input: we read in a sample of 400 single muon events with a pt of 100 GeV/c. This already includes the full reconstruction. We are going to add in the output file the information on tracks refitted with a misaligned tracker. Output: we only store in the output file the branches we might be interested in, i.e. those filled by the CTF track finder (labelled as ctfWithMaterialTracks) and those filled by the refitter (labelled as TrackRefitter). Note: More information on the available tracker misalignment scenarios can be found under TkMisalignmentScenariosCSA07 . Custom misalignment can be applied using the Misalignment Tools. We do this using a second cfg file, the attached misalign-custom.cfg. This file uses the 10/pb misalignment scenario as a base and modifies it. The 10/pb scenario cfg file 10pbScenario.cff is included. With these modifications the misalignment should be similar to the 100/pb scenario. For more details on the configuration of the misalignment scenarios and the available parameters, please refer to SWGuideMisalignmentTools . Two different possibilities are provided to (mis)calibrate the ECAL rechit energies. The first option is to apply a miscalibration factor when the rechits are reconstructed from uncalibrated hits. The second option is useful in the case the rechits have been already reconstructed and one wants to apply a miscalibration. Both methods rely on the use of the package Calibcalorimetry/CaloMiscalibTools. There are only few modifications to the configuration file that are needed in order to perform ECAL rechit energy miscalibration. The only important thing to keep in mind in this case is that rechits reconstruction has to be included in the path since we are starting from a RAW input file. During reconstruction, condition data (ex. intercalibration constants) is retrieved from the DB. Including the ES source CaloMiscalibTools in the configuration file overrides the intercalibration constants used in the rechits reconstruction. The files miscalib_barrel_0.05.xml and miscalib_endcap_0.05.xml contain miscalibration constants associated to each crystal with a Gaussian spread of 5%. These files can be easily produced using the script Calibration/EcalCalibAlgos/test/make_miscalibration.py. The output file is miscalibExample2.root. 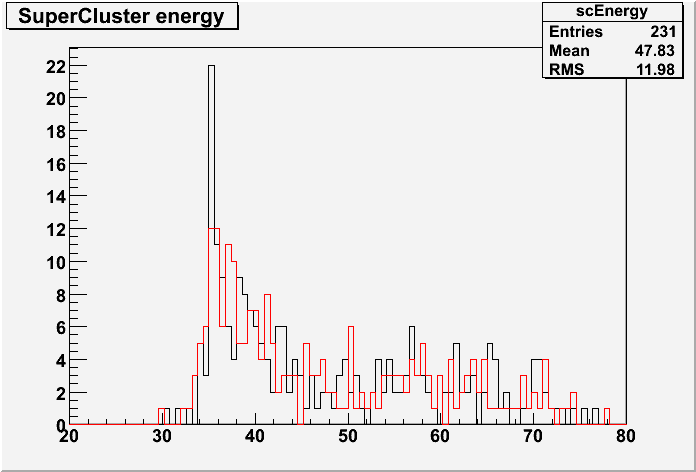 The energy distribution should be the same as in miscalibExample1.root. The possibility to miscalibrate at the level of RecHit, as described above for ECAL, is also available. 2-go to the test directory, you will find the following configuration files: hcalmiscal.cfg It takes as input a RECO RelVal sample for QCD di-jets (Pt=80-0 GeV). The following module is used miscalibrate the already reconstructed RecHits. The file hcalmiscalib_0.1.xml contains miscalibration constants associated to each HCAL cell with a Gaussian spread of 10%. This file can be easily produced using the script Calibration/EcalCalibAlgos/test/make_miscalibration.py. shows how to re-reun the calotower maker using the recalibrated rechits. A similar procedure must be used to produce new objects (candidates, jets, etc.) based on re-calibrated rechits. It is also possible to apply low-level miscalibration using tools, provided by HCAL experts, which overwrite constants (pedestals,gains.etc) in the DB using txt files. For completeness, a detailed description is provided in the attached file but, given the technical details it is considered an "expert tool" and, as such, it is out of scope for this tutorial. In the test directory of the CalibCalorimetry/CaloMiscalibTools you will find the make_miscalibration.py tool. Miscalibrated and misaligned conditions data are not available in the conditions database for the 18X release series. Miscalibrated and misaligned scenarios are currently defined only for the 16X series for CSA07 (10pb-1 and 100pb-1) and 20X series for CSA08 (startup, 1pb-1 and 10pb-1). 2. Add the module TrackRefitter to your path of your cfg. Note that this (and the corresponding lines in 2.) is only needed if you are reading in events with already reconstructed tracks. The startup and 1pb-1 scenarios are the same. For the 10pb-1 scenario, replace TrackerSurveyLASCosmicsScenario in the above with 10pbScenario. 3. Add the module TrackRefitter to your path of your cfg. Note that this (and the corresponding lines in 2.) is only needed if you are reading in events with already reconstructed tracks. For 1pb-1 and 10pb-1 scenarios, replace Muon0inversePbScenario2008 in the above with Muon1inversePbScenario2008 and Muon10inversePbScenario2008 respectively. untracked string fileNameBarrel = "miscalib_barrel_startup_csa08.xml"
untracked string fileNameEndcap = "miscalib_endcap_startup_csa08.xml"
The startup and 1pb-1 scenarios are the same. For the 10pb-1 scenario, replace miscalib_barrel_startup_csa08.xml in the above with miscalib_barrel_10pb_csa08.xml (same for endcap). untracked string fileNameHcal = "hcalmiscalib_startup.xml"
For 1pb-1 and 10pb-1 scenarios, replace hcalmiscalib_startup.xml in the above with hcalmiscalib_1pb.xml and hcalmiscalib_10pb.xml respectively.